The GRIZZLY is our new, fast, safe and a great load carrier. Made for long trips with a lot of luggage. It is fast, tracking well and agile on the edges. The GRIZZLY offers a lot of volume, a huge storage space and a very spacious cockpit, which is comfortable especially for taller paddlers. The high volume is also a further safety aspect when touring at sea. A spacious kayak for long trips or big paddlers! Prijon Grizzly product video from Prijon GmbH on Vimeo. Yellow Grizzlys have red roundabout leashes, bungee deck riggings and bindings of the seat and thigh padding. Red and limegreen Grizzlys are equipped with yellow roundabout leashes, bungee deck riggings and bindings of the seat and thigh padding. 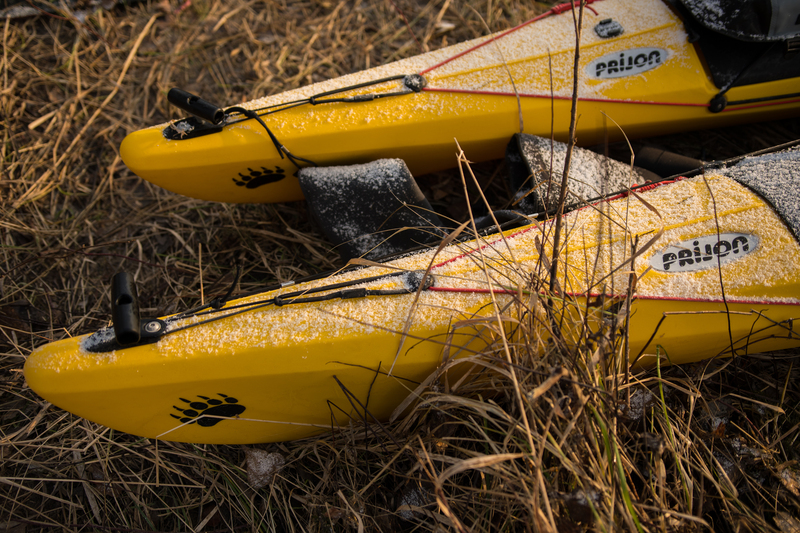 "Winter paddling in Stockholm’s archipelago in the first week of January, when the days are not only incredibly short but also in minus temperature ranges, gave us a good reason to test the new Prijon Grizzly expedition kayaks now available in Sweden and Europe. Replacing the Kodiak after Prijon saw the form was now at the end of its lifetime, they took the opportunity to make improvements and changes to bring one of the worlds most used expedition kayaks to a more improved modern expedition kayak. And keep the ground characteristics of the original Kodiak as a relatively fast stable kayak with a large amount of storage for long distances, as has been proven all over the world with expeditions from Madagascar to the polar regions lasting many months. The biggest change is actually its name, keeping it with in the bear family of names. 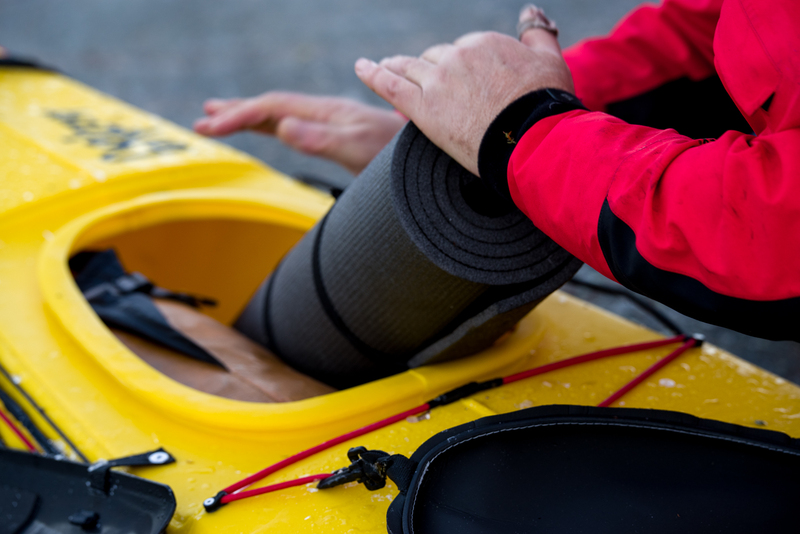 Other changes include new easier to use hard plastic hatch covers, the new Kayaksport forward day hatch system and elastic forward carry handle. The deck has new more modern design and the hull has slightly more rocker giving a little more stability and easier turning. The deck bungee cords are upgraded to a thicker diameter. Also very noticeable is the color co-ordinated decklines, bungee cords and seating trim making them looking great. On our two-day tour, we took advantage of taking a large four person tent, lots of good food, a few beers and enough firewood for the evening. Along with two winter sleeping bags, a foam sleeping mat topped with an inflatable mat, all stored in the three Grizzly’s and one Seayak 500 for Anu our female guest from Nepal. Comfort is the same high standard Prijon set along with the functional responsive rudder system. You can keep smaller items handy in the day hatch, and the paddle scoop indentations on the side are going to help with high wing paddle users or and shorter paddlers. Being made of Prijon famous HTP blow moulded polythene plastic you also know it’s not going to break, deform, or leak and last a very long time, which is why Prijon kayaks hold the highest 2nd hand values of any brand. The size of the kayak is going to mean it is not ideal for shorter lighter paddlers, but suit medium to the largest of paddlers with large feet who need space to sit comfortable for longer periods. It is also not a play kayak, it’s a kayak for going A to B in the shortest period carrying all you need." Our new products for this season! A fast, safe and a great load carrier. Excellent tracking and agile on the edges. A spacious kayak for long trips or big paddlers! The first ever crossover-kayak from Prijon with skeg. Quick walkthrough in the video. 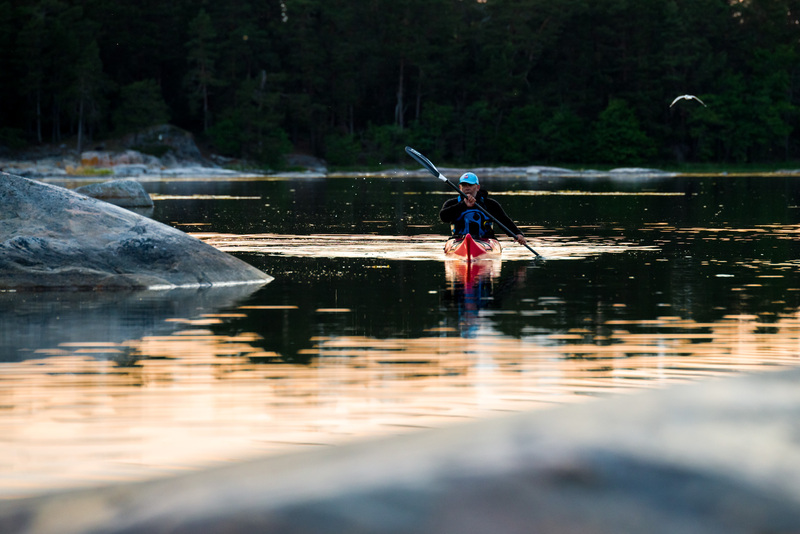 Produkt video about our new fast, safe and great seakayak. Check the video to see it on the water!